Gourmand Card is Ready for YOU! Get More and Spend Less! What if you got at all at just one time? Introducing you, the Gourmand Card, our special and distinguished loyalty program uniquely designed for your freedom to get more and more with plenty of options to be pampered from. 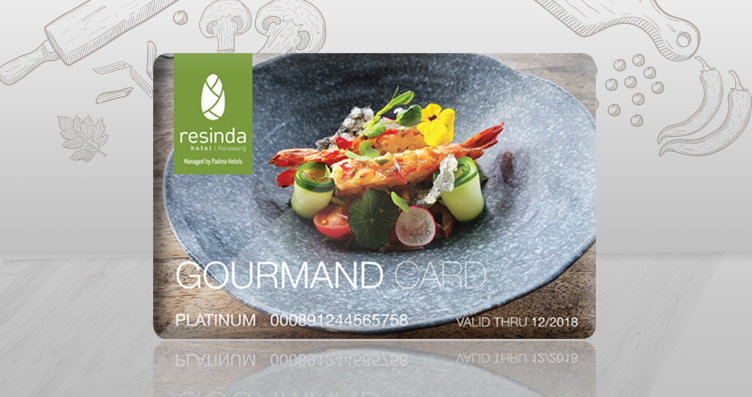 The Gourmand Card is the topnotch loyalty program from Resinda Hotel Karawang, managed by Padma Hotels that offers extraordinary experiences, rewards and recognition whenever you visit us. Members have incredible access to exclusive benefits and flexible reward options for magnificent either business or leisure matters. All of this comes with the added benefits even more, from our resort-inspired rooms, wellness center, restaurants, and on, it’s all yours. 5 (five) complimentary vouchers of buffet at The Oryza Restaurant, Tenkai Japanese Restaurant and Haiwang Chinese Restaurant (not included dinner at Inaho Japanese Restaurant and Haiwang Chinese Restaurant).